50 years on from the historic Ford 1, 2, 3 victory at the 24hr of Le Mans, Ford lined up on the starting grid once again. 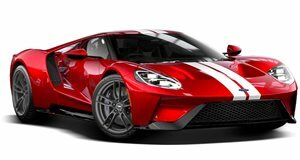 The car – a new Ford GT – but the goal was the same; to beat Ferrari once again in a grudge match that’s lasted half a century. Ford succeeded, beating Ferrari and winning Le Mans once more. Limited to 1000 units, the Ford GT supercar was developed in unison with the Le Mans racer – featuring a carbon fiber chassis, incredible active aero, and an all-new turbocharged V6. This is the return of the all-American supercar. Arrive at your favorite racetrack, press a button, and the ride height drops to a raceworthy height – not lowering slowly on gas struts, the hydraulically operated suspension quite literally drops 2 inches in front of your eyes. In this state, it’s quite literally bottomed out, so cornering on track is a flat out affair – solid with zero body roll whatsoever. The steering is gorgeously weighted – and incredibly direct. This isn’t tuned separately for the road-going car, it’s full race car spec. The front end is lively, direct, and pinned to the ground – front end grip is absolutely immense, due to active aero gluing the sticky tires to the road. The front end grip is only usurped by that of the rear, where 325/30 profile Michelin Pilot Sport Cup 2s get jammed to the surface by a massive hydraulically actuated rear wing. It can go fast, it can corner, and thanks to carbon ceramic brakes as standard, it stops too – exceptionally well. 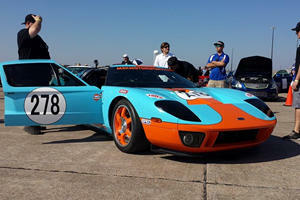 Ford received much criticism for its decision to equip the GT with six cylinders – it’s not the American way after all. But the 3.5-liter twin-turbocharged EcoBoost develops 647 horsepower and 550 lb-ft of torque – and it feels even more potent than the numbers suggest. A 7-speed dual-clutch automatic handles the power on its way through to the rear wheels. 0-60mph takes a shade under 3 seconds, and flat out you’ll hit 216mph in V-MAX mode with the rear wing retracted for minimum drag. As for noise, the V6 wails gloriously at full tilt – but at part-throttle it somewhat drones. Despite its obvious performance pretensions, the Ford GT still features some creature comforts. Ford’s SYNC 3 touch screen infotainment system is standard and features a full Smartphone connectivity. 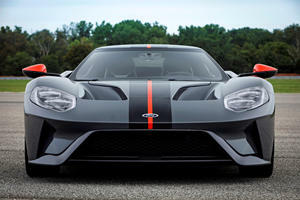 But it’s the visual options that are exciting, with an assortment of colors, traditional Ford GT stripes, colored brake calipers, and even 20-inch carbon fiber wheels available in a range of designs. As a supercar, no crash testing has been conducted, and Ford doesn’t say what safety features it has. But, ABS brakes with EBD, electronic stability control, and traction control are all standard, along with that inbuilt roll cage – FIA approved. 50 years on from the original Le Mans 24hr victory and Ford have delivered another smash hit – if you were one of the lucky few to be allocated one. The Ford GT is the American supercar to bloody the noses of the European elite. All hail the working class hero!